Gerhard Richter, Catalogue Raisonné, 1962-1993, Ostfildern-Ruit, 1993, Vol. III, p. 182, no. 637-4 (illustrated in color). London, Anthony d'Offay, Gerhard Richter, The London Paintings, March-April 1988, no. 5 (illustrated in color). Minneapolis, Walker Art Center, The Cities Collect, September 2000-January 2001. In his catalogue text to the 2002 retrospective exhibition of Gerhard Richter's work Robert Storr declared that Richter's landscape paintings accentuate a "gap between two pictorial situations", two situations that he describes as the "photographic and the painterly". It is in the later landscape paintings from the 1980s onwards, Storr maintained that "the tensions increase between the desire for one thing (a beautiful imaginary place to which the viewer might escape) and the actuality of another (a beautiful painting that checks that escape and makes the viewer acutely conscious of its impossibility)" (R. Storr, Gerhard Richter, exh. cat. Museum of Modern Art, New York, 2002, pp. 67-68). 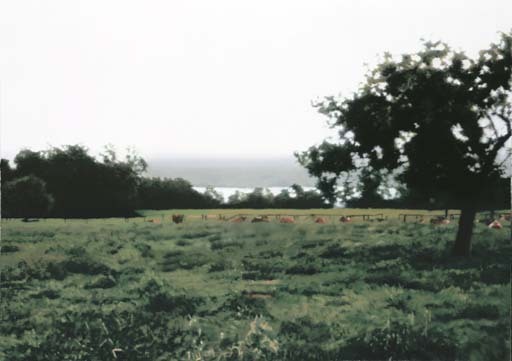 Painted in 1987 from a photograph Richter took of the countryside around the Laachersee in 1986, Laacher Wiese (Laacher Meadow) with its depiction of a peaceful meadow slanting its way down to a lakeside vista is a particularly pertinent example of the kind of double standards of Richter's art that Storr has identified. "Those who approach Richter's landscapes with a yearning for the exotic or the pastoral" Storr argues, "are greeted by images that first intensify that desire and then deflect it" (ibid., p. 68). This is entirely Richter's intention in his creating of such seductive landscape paintings in the first place. Based on photographic snapshots of typical romantic pastoral idylls, Richter plays with our perceptions of reality in such a way as to ultimately refute their meaning. "Of course my landscapes are not only beautiful or nostalgic, with a Romantic or classical suggestion of lost Paradises," Richter wrote in 1986, "but (they are) above all 'untruthful' and by 'untruthful' I mean the glorifying way we look at Nature - Nature, which in all its forms plays against us, because it knows no meaning, no pity, no sympathy, because it knows nothing and is absolutely mindless: the total antithesis of ourselves, absolutely inhuman. (G. Richter, "Notes 1986" The Daily Practice of Painting, London, 1995, p. 124). "Every beauty that we see in landscape," Richter continued, "every enchanting color effect or tranquil scene, or powerful atmosphere, every gentle linearity or magnificent spatial depth or whatever - is our projection; and we can switch it off at a moments notice, to reveal only the appalling horror and ugliness. Nature is so inhuman that it is not even criminal. It is everything that we must basically overcome and reject - because, for all our own superabundant horrendousness, cruelty and vileness, we are still capable of producing a spark of hope, which is coeval with us, and which we can also call love. Nature has none of this. Its stupidity is absolute" (ibid, p.124). Laacher Wiese belongs to an important group of landscape paintings that Richter painted of the countryside around the Koblenz area of Germany in 1987. Richter's paintings of this year reflect the artist's last concerted interest in the landscape format. In the years since then, Richter has painted only a relatively few landscapes, and these are usually isolated examples. Laacher Wiese is consistent with the majority of Richter's landscapes of the 1980s in that it reflects the artist's increased interest in the contrast between foreground and background. With its low horizon line and its deliberately non-aesthetic viewpoint, Laacher Wiese is typical of these Koblenz landscapes in its stress on juxtaposing the ordinariness of the scene with the sense of the spiritual that almost any beautiful natural vista will instil in the viewer. Consciously exploring the contrast between the tangible reality of the foreground and the ethereal mystic haze of the lakeshore merging with the sky in the distance the painting clearly reflects the investigative and analytical approach of Richter's art in a manner similar to his wholly artificially constructed seascapes. Like them, Laacher Wiese reflects Richter's desire to explore beyond the bland sentimentality and romanticism inherent in the landscape tradition to ask the more pertinent question as to why such pantheism continues to hold an appeal even when one its inherent falseness and artificiality is made plain. "I lack the spiritual basis which undergirded Romantic painting," Richter has explained, "We have lost the feeling of God's omnipresence in Nature. For us, everything is empty. Yet, these paintings are still there. They still speak to us. We continue to love them, to use them, to have need of them." (cited in, I. Lebeer, "Gerhard Richter ou la Réalité de l'Image", Chronique de l'Art Vivant 36, February, 1973, p. 16).